Waldorf dolls use special materials to engage the sensory needs and imaginations of young children. Over fifteen years ago, I fell in love with natural toys. At the time my first son was born, it was only natural since I lived in California and was already into natural childbirth, natural clothing, and natural foods. After my son turned one, we moved back to Michigan to be closer to family. There, one of my friends, Leslie, from my natural foods buying club introduced me to the world of Waldorf (she was enrolled in the Waldorf teacher training program). The year was 1999 and we were idealistic new parents, very conscious of health and the environment. When my son was two-year-old, I brought him to Leslie’s Waldorf playgroup, and watching his response to the toys and activities there, I knew the Waldorf approach to early childhood was something special. “Waldorf” toys, named so because they are used in Waldorf schools, are intentionally simple to allow children the freedom of using their imaginations when playing. They are made of natural materials, beautiful to look at and feel good in your hands. Leslie and another friend who was also in Waldorf teacher training helped me to understand the philosophy behind Waldorf toy design. 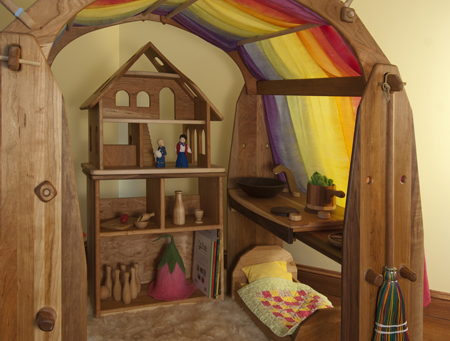 Wood is one of the natural materials featured prominently in Waldorf toys. It is beautiful, non-toxic, and pleasant to touch. 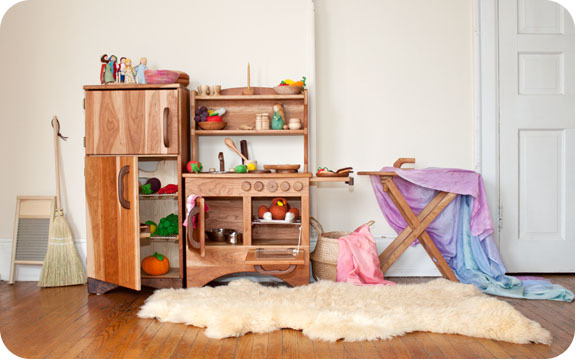 Play kitchen sets like this also encourage hours of pretend, which nourishes children’s imaginations. It boils down to this. Young children approach toys with all of their senses (there are twelve senses – but that is another topic), beginning with touch, smell, and sight. As adults, we are attracted to or repelled by our environment based largely on our sense of sight, but little ones respond to their environment using touch and smell just as much. Equally important, Waldorf toys engage children’s natural curiosity because they encourage “pretend.” In short, when selecting toys, Waldorf educators ask questions like: How does it feel? How does it smell? Can it be played with in more than one way? In other words, will it nurture the imagination? This is what makes Waldorf toys so different. Waldorf dolls represent a special style that emphasizes natural materials and European doll-making techniques. Their bodies and heads are made of cotton and stuffed with wool, so they are naturally soft and warm to touch. Minimal facial features allow for the entire range of human expression through the imagination of the child. Additionally, holding a Waldorf doll gives the child a realistic experience, not only because it is warm, but also because the weight of the doll is significant, unlike hollow plastic dolls. 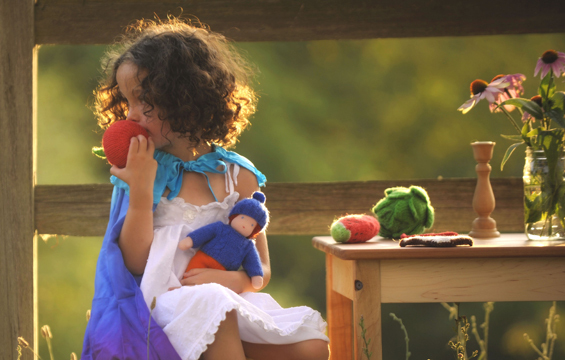 Waldorf dolls are made with pure organic wool and cotton and have simple facial features to allow for the full range of human expression within the child’s imagination. 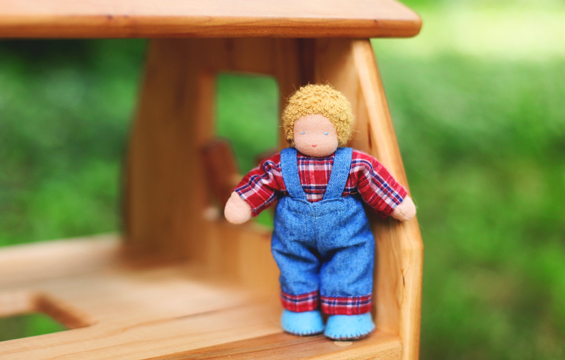 The first time I took a Waldorf doll making class, I was excited to learn the steps first-hand…and then, I was surprised at how much time and effort was involved! The class comprised three two-hour weeks, plus nearly double that time in homework. My doll was the simplest kind, without sewn legs or a full wig, but I can still remember the cramps in my fingers from learning to wrap the wool roving tight enough to form a firm ball for the head. All this work changed my whole understanding of why the Waldorf dolls seem to be so expensive. In class, we made our dolls with 100 percent wool innards and recycled fabric on the outside. A discarded turtleneck interlock was perfect for the face, and old sweaters made excellent bodies and hats. Even though my first doll has many imperfections, it is one of the most loved items in our playroom. I understood Waldorf dolls better after making one in class — here is the result of my effort! 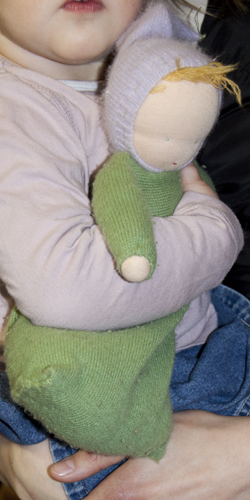 Even though my first doll has many imperfections, it is one of the most loved items in our playroom. Fast forward about 15 years: we now have three boys, ages 15 to 7, and my husband has trained as a Waldorf teacher and also spent three years home-schooling. Of course, our kids play with other toys too, but the perennial favorites haven’t changed much. It’s the playsilks, blocks, marbles, and most of all, playstands. I can’t even begin to imagine how many hours the kids have passed engrossed in fort-making and store adventures. My husband eventually trained as a Waldorf teacher and has homeschooled our three boys. They play with other toys too, but the perennial favorites are still the playsilks, blocks, marbles, and most of all, playstands. I can’t even begin to imagine how many hours the kids have passed engrossed in fort-making and store adventures. Among the girls who play at our house and in the toyroom at the store, the Waldorf dolls and wooden kitchens are hugely popular. I’m very excited that we’ve just introduced a line of poseable dollhouse dolls that are made in the Waldorf style but without metal wire inside — our dollmakers use jointed string construction to achieve the poseable feature. Customers were raising concerns about metals inside dollhouse dolls, and we’re very pleased to offer this sweet alternative. Check them out here, and let us know what you think. We love hearing our customers’ stories. What Waldorf toys do your children love most? Our new Waldorf style dollhouse dolls feature Camden Rose craftsmanship, without potentially hazardous metal wiring inside.